With gamescom 2018 kicking off in Cologne, Germany, the next few days will be filled with all sorts of game announcements. Ubisoft has gotten a jump start on things, however. Ahead of the event, a twenty-four minute Assassin’s Creed Odyssey gameplay video has been released, showing off what might be a legendary showdown. 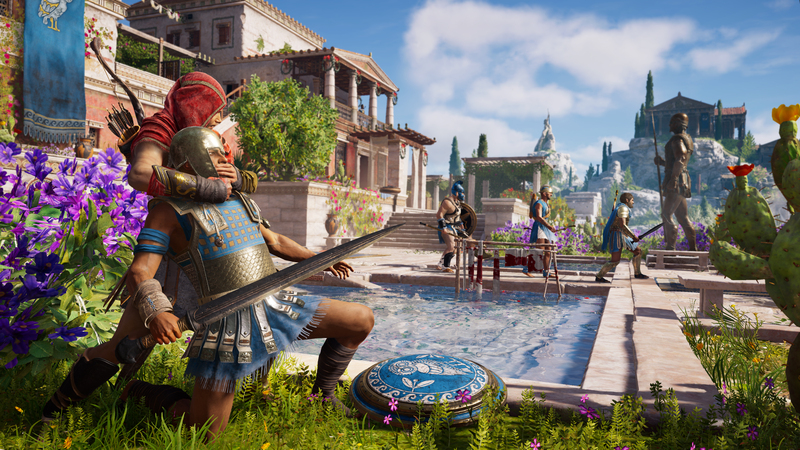 In the lengthy Assassin’s Creed Odyssey video, you’ll see Kassandra engaging in combat, exploring, and fighting a boss battle versus the mythological Gorgon, Medusa. This Assassin’s Creed Odyssey gameplay video opens with Kassandra trying to stop a fight between a mob leader and a woman named Bryce. Apparently, Bryce stands accused of sacrificing her lover to a malevolent creature in the woods. Kassandra promises to help and is warned not to head into the petrified temple. In agreeing to take the quest, we see dialogue options that allow Kassandra to either learn more about the creature or leave immediately. Kassandra spends the bulk of her time fighting mercenaries and slinking through areas in the Petrified Valley. When she finally reaches the Petrified Temple, all hell breaks loose. Assassin’s Creed Origins was the first main line game in the series to feature boss battles with mythical creatures of yore, and that continues in Assassin’s Creed Odyssey. As expected, Medusa seems to be a formidable foe. Her petrification abilities can slow Kassandra to a crawl. Should the effect carry on for too long, Medusa can presumably stop the assassin dead in her tracks. This boss battle is evidently a tough one, which begs the question of whether or not other figures from Greek mythology will appear in a similar fashion. We’ll know for certain what Assassin’s Creed Odyssey has to offer when it comes to the PlayStation 4 on October 5, 2018.